Ok, I lied a little bit. Sometimes caterpillars come out in the winter. If you live in the US or Canada and see a fat brown caterpillar sauntering across the snow, it is probably Noctua pronuba, the Large Yellow-Winged Dart. It is an introduced species from Europe which has spread across much of North America. The caterpillars feed on all sorts of grasses and forbs, so they can be found just about anywhere (and if you find one, you can feed it just about anything). When we rear these caterpillars in the lab, we simply step outside the building and grab a handful of grass. 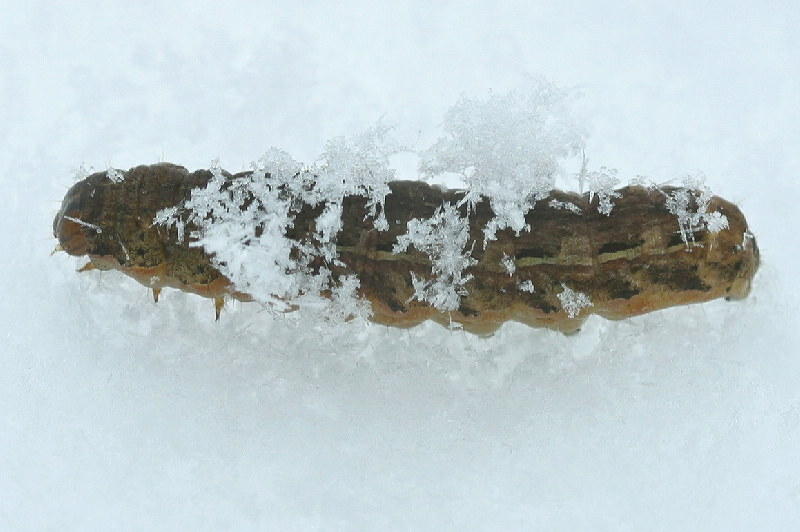 Why these caterpillars frolic in the snow remains a mystery. Many species in the same subfamily (Noctuinae) overwinter as larvae, and emerge to feed on warm days in early spring. However this species takes it a step farther, crawling and foraging on bitter cold days when no sensible caterpillar would be out and about. While most caterpillars wait until April or May to emerge, this species can be seen as early as January! Sometimes they even emerge en masse, hundreds of caterpillars wriggling on the snow. This strategy does not appear to hinder the species, as Noctua pronuba is one of the most abundant moths in many parts of its range. The caterpillars appear to be stimulated into action by one or two “warm” days, which may be just above freezing. Perhaps they have become overly sensitive to temperature changes, causing them to emerge in the snow instead of waiting until spring? While it might not seem like there would be food available to a caterpillar in January in the Northeast, these caterpillars are not picky. Many of them attack roots of plants. As an agricultural pest, Noctua pronuba may feed on exposed annual plants if they are not covered by snow. This might provide enough of an advantage to the caterpillars that it balances out potential mortality due to the cold and predation (a brown caterpillar is pretty obvious on white snow). But studies would have to be done in order to say for certain. Have you seen any caterpillars on the snow? Have you seen any that are notNoctua pronuba? And does anyone know if they also appear on the snow in Europe, or is it a behavior expressed only in North America? -Wagner, D. 2011. Owlet Caterpillars of Eastern North America, Princeton University Press, pg. 538. Posted on March 12, 2013, in Invertebrates, Lepidoptera, Noctuidae and tagged caterpillar, cutworm, Noctua pronuba, Noctuidae, winter caterpillar. Bookmark the permalink. 8 Comments. I remember, as a young girl one winter (living on the east coast of Nova Scotia) going outside to play and finding hundreds of these on top of the snow in the yard. But every time I tell people the story they think I am nuts and/or making it up! Glad I finally found an article that explains what I saw and that it is indeed possible! I found these on the snow this morning, by our barn on an island off the coast of Maine. There were also some smaller green ones half the size of the brown ones. We’ve just had erratically warm, then cold, then warm weather with a thundersnow storm last night. We found one in Sweden! One snowy day in January our daughter found what she recognized as the caterpillar that escaped her last summer. It was laying in the snow just outside our country house and appeared diseased at first. After a couple of hours in our daughters hands it slowly started moving which made her more than happy. Her parents were not so enthusiastic but she was allowed to bring the caterpillar inside and feed it with salad. After a couple of days it turned brownish and a week later it turned into a cocoon. Yesterday he was reborn as a butterfly! Currently he is feeding from sugar and water waiting for the weather to become a bit warmer. I found one that was not Noctua… it was entirely black (or very dark brown) and fuzzy. Have you ever heard of a woolly bear color morph that was all black? This one was pretty small and skinny too. Just over an inch long. Just lying in the snow, not moving. But it was on top of the snow and some snow had melted on it, leaving water droplets along its hairs. It was in Flagstaff, Arizona, USA. Any info you have on what this might have been would be greatly appreciated!